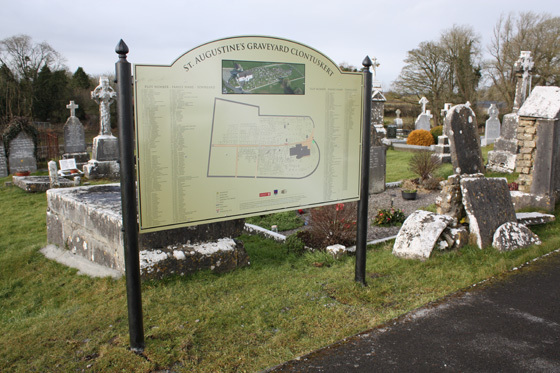 Clontuskert Heritage Group, in partnership with Galway County Council and Galway Rural Development, has embarked on an ambitious project to digitally map, transcribe and photograph the grave-plots and headstones in the three cemeteries of the parish - St. Augustine's in Crossconnell, St. Matthew's Glenloughaun and the Old Abbey. Even though many of the headstones were difficult to read, the Heritage Group members stuck to their task and painstakingly recorded the details, often despite the inclemency of the weather. The memorials in each cemetery have been photographed and the inscriptions put onto a database. Cartographer Padraig Higgins has produced a very detailed map of each graveyard. A map board has been placed in St. Matthew's and St. Augustine's to help visitors find their family plot. The map board for the Old Abbey will be erected as soon as permission has been obtained from the Board of Works. The information was sent to Galway County Council where the GIS Officers, Mark Conroy and Bridin Feeney and Webmaster Ciaran O'Donnell have formatted the information so that it can be accessed on Google Earth at the Galway County Council website www.galwaycoco.ie. The results of this project should prove invaluable to people who wish to locate their loved ones' graves in Clontuskert. Anybody with internet access will be able to see exactly where their family is buried and see a photograph of the grave and headstone. They will also have access to the memorial transcriptions and this is particularly useful where a headstone is difficult to read. The results for St. Augustine's cemetery are now available by clicking here.